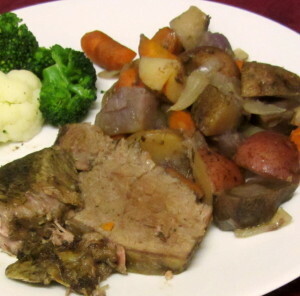 The big difference in recipes for pot roast is seasoning. My mother used peppercorns, bay and cloves, so that’s what I did here. I have a friend who swears by the herb savory for anything with beef – another who wouldn’t dream of cooking this without allspice. This is really a pretty mild seasoning – if you like something stronger, by all means use it. For the cooking liquid, I used wine vinegar and water – I want both the flavor and a bit of acid (which helps tenderize the meat.) When I regularly had wine in the house, I sometimes used half a cup of it. I could also use half vinegar, or wine, and half broth – or all broth, for that matter… the acid helps a little but the meat will really be fine without it. Flavor is more important. The recipe is really easy – honestly, more a method than a recipe. I’m giving you the measurements I used, but they are not carved in stone – usually I would use more carrots and fewer potatoes (especially if I wanted to serve it with bread to sop up the gravy.) I could easily sub in a few other root vegetables. But here’s what I did, and what you see in the pictures. I had a piece of round that was about a pound and a half – which is enough for around three meals for us. I used to use a chuck roast for this, but they’ve become much harder to find, to my great annoyance. 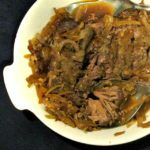 Brisket is classic and wonderful, but has oddly become more expensive – probably because it is the cut many people look for when they want to make Grandma’s Pot Roast. 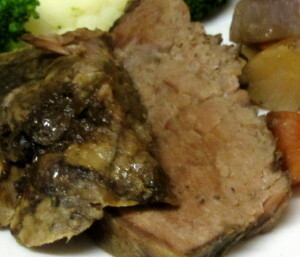 At the moment, I can easily get a round roast, so I do. 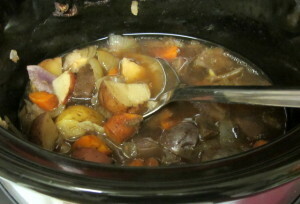 And I used the 5 quart slow cooker, not the larger one. 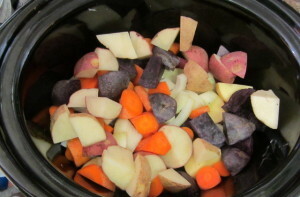 If I was using a larger roast, I would use a 7 quart slow cooker, and increase the vegetables and spices, but otherwise the directions (and the amount of liquid) would stay the same. I scrubbed and cut up a pound and a half of potatoes, and half a pound of carrots. 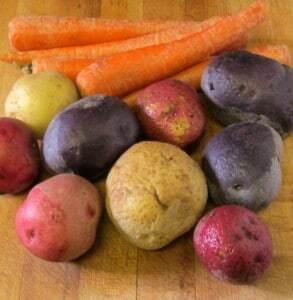 As it happened, I had a bag of tri-color potatoes – red and blue, as well as white – not what I usually have on hand! Normally, I’d use basic white potatoes, maybe yellow… boiling potatoes, not Idaho russets, which are the best for baking, and also work well for mashed potatoes. I also peeled two onions, quartered them and sliced them. Then I started to put things in the pot. 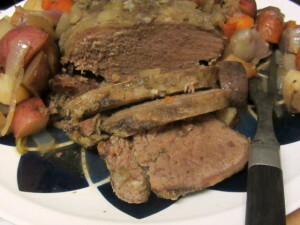 One thing to understand about slow cookers is that layering is important… it matters very much what is on the bottom in liquid, and what is on top, out of it… The bottom will cook faster, the top slower, the bottom layer will be moister (and often even fall apart) and the top will be drier and firmer – and sometimes undercooked, if you aren’t careful. 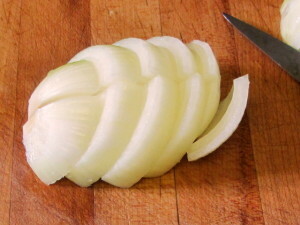 So, in this case – I started with half the onion, which will soften and add to the liquid, and help flavor everything. Then I put in the potatoes and carrots. I wanted to season this, so I added 1/2 teaspoon whole peppercorns, 4 cloves, and 1 bay leaf, and mixed them in with the vegetables. Then I poured over the whole 1/4 c red wine vinegar, and 1/4 c water. 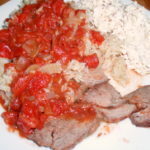 I then placed the meat on top of the vegetables, and arranged the rest of the onion over it, so that it would melt and the flavor would permeate the meat. I served it with just the cooking liquid as it was. If I wanted a thicker gravy, though, I’d pour a cup of it off into a small saucepan, and stir in a roux cube to thicken… I did that the next day, when serving leftovers, with the liquid that was left (boosted with a bit of broth – there wasn’t quite enough) so we had a real gravy to moisten it. Another time, too, I might cook it with fewer potatoes and more other vegetables, and eat all of that in the first meal – and not have to add anything more. This time, since there weren’t many carrots, I did add some broccoli, on the side. And of course, that’s what I would do if I was expecting to serve most or all of it to a larger family. This would serve 4-6, depending on ages and appetites – I’m not under any illusion that the amount that the two of us eat would be enough for, say, two teens… or two serious athletes, either. This is the reason I never say how many a recipe will serve – how many of whom? My late husband ate nearly twice what I did… but he was also 8″ taller… Rich eats about the same amount I do. So, I just tell you, I’m cooking for two adults, who are moderately sedentary (but do walk more than many people) and eat almost nothing between meals. You work out how much your family will need. 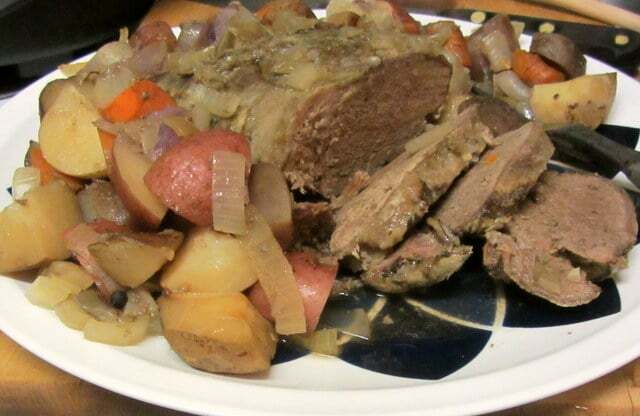 A basic slow cooker pot roast - the classic recipe. Simply layer a few ingredients in the pot, and let it cook until you are ready! Scrub potatoes and carrots and cut into bite sized pieces. Quarter and slice onions. 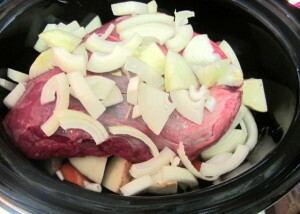 Place half the onions into the bottom of a 5 quart slow cooker. Layer the carrots and potatoes over the onion. Add the spices and bay leaf. Pour the vinegar and then the water over the vegetables. Place the meat on top of the vegetables. Spread the rest of the onion over the meat. Cover.